(July 11, Colombo, Sri Lanka Guardian) Israel invaded Gaza and South Lebanon in 2006; waged a savage war over a couple of Israeli privates taken into custody by Hamas/Hezbolleh in Israel’s front lines. Big powers and UN involvement internationalized the issue. 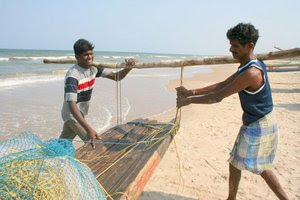 In stark contrast Sri Lanka (SL) took captives over 1000 Indian (Tamil) fishermen and 250 fishing boats in Indian waters. Except for protests in TN not a whimper from Delhi a nation aspiring for a regional power role forged through Narayanan’s India/US/Israel/Sri Lanka axis vision. The much hailed apologists’ axis strategic thinking for an India’s regional leadership received a prompt snub from SL though the TN fishermen’s issue. Delhi’s craving to appease SL at any cost drives its passivity even in the face of such a major military adventure on India by SL. Does Delhi’s cooling off of interest in the Tamil cause and TN sensitivities also extend to ignoring TN sensitivities when TN and its fishermen are subjected to SL aggression and TN fishermen (aren’t they Indians) are captured, interrogated and held captives in a foreign soil? India’s inaction means in effect delivering to SL an Israel style role in regional security in India’s soft underbelly on a platter. TN is in this soft underbelly and the fishermen’s issue proves TN’s vulnerability and Delhi’s indifference to TN’s plight. Thus on the TN fishermen’s issue SL created a precedent setting role in characteristic Israeli style. India paradoxically shied away from protesting leave alone providing armed protection to its citizens (the TN fishermen and their assets – the fishing boats). Leaked reports claim that Narayanan raised the Indian fishermen at the recent Colombo conference behind closed doors and no communiqué was issued after the conference. That SL acted on this scale within a week of the conference raises questions on whether the fishermen’s plight was ever raised at the Colombo meeting. The leaked reports were possibly for the consumption in India and elsewhere. Would such leaked reports satisfy TN, mainstream Tamils and its fishermen victims? Only an India emboldened SL would embark on an action/war on this scale capturing not a few but a thousand Indians (fishermen) and Indian assets (fishing vessels). Such an operation required planning (it was planned strangely when Narayanan was in the conference in Colombo with key persons who were directing the operation) and the assembling of a flotilla large enough to ensure a speedy and successful outcome for SL. Did the Indian intelligence and Indian navy fail here badly? In effect SL action went beyond ignoring the Indian concerns as delivered at the Colombo conference. It was meant to serve as a prompt and stern rejection of concerns India expressed over the fishermen’s issue. SL delivered its response to Narayanan's message forcefully and in stern warlike Israeli style. Quo Vadis Narayanan’s India/US/Israeli/SL axis and Indian regional power role ambitions? That Indian inaction (verbal/diplomatic/military) over this issue is the logical extension of India’s recent SL policies analysed in V S Subramaniam’s piece ‘THREAT TO INDIA’S SOFT UNDERBELLY’ 30 May 2008 in this website. This article developed Anil Athale’s theme in his ‘Lanka Turmoil’ Rediff of 11 January 2008 highlighting the meekness, helplessness and paralysis that afflicts post Rajiv era SL policy. Since the Rajiv/JR 1987 deal from which India is still unable to extricate itself from, Delhi Congress regimes unlike non-Congress regimes remain saddled with those commitments to SL. Hence the continuation of Indian pro-SL genocide stance commenced with Rajiv’s and RAW’s role fomenting inter-group rivalries and killings (and blaming them on the Tamil resistance), Rajiv’s unethical 1987 ‘kill Prabaharan’ order, engineered dismissal of the TN government and after 2004 Natwar Singh lobbying with EU to list the Tamil resistance/LTTE ‘terrorist’, supplying SL intelligence, weapons and funds for their purchase, voting for SL (a flagrant HR abuser) for a seat in the UNHRC. Evidence of these is in General Harkirat’s book. In effect Delhi continues with Rajiv’s failed IPKF policies disavowed by all concerned parties as clumsy and detrimental to peace in the region. The TN factor – is it just a mantra? Reference is constantly made to the Tamil Nadu factor when Indo-SL relations are discussed. Events have proved that this has no substance; it is a mere mantra. To have substance a unified Delhi-Chennai approach to SL is a must. This is sadly missing. In comparison to the anti-Tamil cause measures of the Congress led Delhi listed in the preceding paragraph the BJP led rule caused the least harm to the Tamil cause. Please see ‘THE TAMIL CAUSE BETTER SERVED – UNDER A CONGRESS OR BJP LED COALITION’ in this website June 24 2008. During this Congress Delhi period SL policy was deliberately made to look muddled to disguise its support for SL’s genocide on Tamils. TN Tamils suffered from excessive intrusive surveillance on its pro-resistance sensitivities. It is only the coalition polity logjam that holds the Delhi – Chennai coalition together. The poor state of Delhi-Chennai relations is unlikely to sustain the Congress led Delhi coalition long pre or post elections. The performance of the Congress Delhi on the fishermen’s plight will be the acid test on the substance in the TN factor. SL apologists claim that TN Tamils may overlook Delhi over-appeasing SL over the Tamil resistance/LTTE but would they when fellow Indians (TN fishermen) are subject to POW humiliation in SL. The longer it takes for Delhi to obtain the release of the TN fishermen Delhi’s concern for TN Tamils will show-up as shallow. Memories of SL’s animosity towards India amongst the generality of Indians will resurface to curtail SL Israeli style role in India’s soft underbelly. Delhi leadership acted so meekly that TN chief Minister had to write to Delhi calling on it to act on this issue. An SL apology for its action is in order. Delhi needs to pursue vigorously for compensation for distress and other loss to the TN fishermen with SL; failing which some form of sanctions may be seriously considered. TN fishermen and TN to consider their own arrangements to overcome intelligence and Navy failures to prevent similar SL attacks in the future. Chennai may consider extricating itself from its partnership with an unreliable Delhi Congress before the forthcoming elections. Erratic and queer changes are a feature of coalition polity in India that unless Congress Delhi sets limits on its Buddhist/Sinhala appeasement, mainstream Tamils in TN and Indians as a whole are unlikely to remain passive observers of the trauma unfolding it TN India’s soft underbelly. Preventing permanent alienation of the mainstream Tamils becomes most critical for Indian Union and Congress Delhi’s energies needs to be directed at nurturing unity within the Indian Union above everything else be they deal/money politics and contrived excuses like keeping India’s regional leadership role intact and keeping out phony foreign powers gaining a foothold in the region. The latter thesis betrays its phony nature in the context of SL’s strong track record persistently undermining India’s leadership role over the past half a century. Anil Athale’s threat to India’s soft underbelly – how real? In view of the above the following quote from ‘THREAT TO INDIA’S SOFT UNDERBELLY’ 30 May 2008 veluppillai.sulekha.com blog has some relevance. ‘One could postulate that Anil Athale’s ‘India soft underbelly’ from a historical perspective refers to Sri Lanka (SL) emerging role as an Israeli like ‘genie’ that turned the Middle East into the world’s hottest spot. A rearmed SL (thanks to Congress Delhi’s own contribution) also has the potential to extend the conflict beyond its boundaries to engulf the region, specifically TN that is in the front line. How reliable will the Congress Delhi’s protective umbrella be to a vulnerable TN will be judged from how firmly Delhi now deals with a recalcitrant SL on the fishermen issue. SL has given TN/Delhi a foretaste of the dangerous Israeli style role it proposes to play in the region that Delhi’s continued appeasement of SL at the expense of TN sensitivities, threats to TN communities and assets and the Indian Union itself becomes meaningless. This issue is going on for a long time. It is not the fault of Sri Lanka Navy that Indian Fishermen ventured in to Sri Lankan waters and LTTE smugglers mix with them to get their sypplies of wepons, explosives and other counter band products to use for terrorist activities. There is on alternative for the Sri lankan Navy to protect the maritime boundary and try to stop terrorist activities in Sri Lankan waters. According to the SL navy, the Indian fishing boats were in the Sri Lankan waters. If that is true the arguments made in this article has no merits. SL navy has a very good reputation. They do not make statements arbitrarily. I am sure the SL navy as well as the Indian navy is aware of the illegal activities between LTTE and some LTTE sympathizers and smugglers in TN. It is ironic that there were over thousand fishermen cross to SL waters when Narayanan was in the conference in Colombo. As a matter of fact it needs lot of planning to assemble over 250 fishing boats and thousands of fishermen to cross into SL waters specifically on that day. The question is who is behind this organization. Who is playing with the lives of the innocent Tamil people who are under the siege of LTTE? It is apparent that the LTTE is losing its grip on Tamil people. Also it is obvious the LTTE is losing its war against the government of Sri Lanka. But LTTE still has some funding that could use to buy influence in TN. This article is trying to create a totally distorted picture of Sri Lanka and its vision for the future. People in Sri Lanka are very much aware of their roots. Their main religions Buddhism and Hinduism, the roots of their language Pali and Sanskrit, and their ancestors they all came from India. So it is really absurd to paint such a dangerous and bleak relationship between Sri Lanka and India. India can help Sri Lanka to eliminate the terrorists who killed their own Prime Minister Hon. Rajiv Gandhi, and India can help the government of Sri Lanka to rescue the innocent Tamil Sri Lankan’s who are held by the LTTE. Peaceful Sri Lanka is a blessing for India. Majority of Indians will agree on this. If we do not eliminate LTTE now, it will be a greater headache to India in the future. Remember, Tamil Elam includes Tamil Nadu/ Dravidastan. North indians never give a damn about Tamils. India's age old problem - pak, is just a struggle by the north central muslims to assert their power and the punjabis in the west and bengalis in the east paid a price for it. As far as India is concerned, anything north-central/hindi symbolizes India and the Tamils will always be second-class citizens. This can also be seen in the apathy that is shown towards the many fishermen who are shot dead by the sinhalese with impunity and the complete non-coverage in any of the main line news channels like ndtv, ibnlive etc !